LOUISVILLE, Ky. — Lt. Gen. Stanley E. Clarke III, director of the Air National Guard, toured the Kentucky Air Guard Base here April 11-13, meeting Airmen from units across the 123rd Airlift Wing and kicking off Thunder Over Louisville, one of the largest air show and fireworks displays in North America. 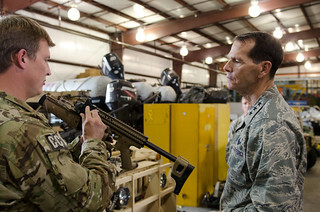 Clarke also inspected the wing’s unique mission capabilities, including the only fully operational contingency response group in the Air National Guard and a special tactics squadron that combines both combat control and pararescue functions, according to Col. Barry Gorter, commander of the 123rd. He was especially interested in learning more about the contingency response and special tactics units here. Click here to see all of the photos from this event. A contingency response group functions as an “airbase in a box,” Gorter said, providing the ability to rapidly establish an air cargo hub at remote locations worldwide in support of military operations or disaster-response missions. 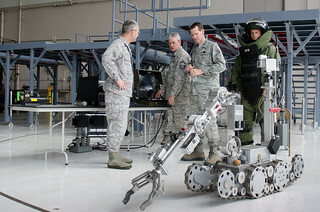 The unit’s Airmen are completely self-sufficient, bringing everything from housing, communications and power generation to all-terrain forklifts, aircraft maintenance and security forces. Special tactics Airmen are among the most highly trained operators in the U.S. Military. Combat controllers are certified air traffic controllers who deploy undetected into hostile environments to establish assault zones or airfields while simultaneously conducting air traffic control, fire support, command and control, direct action, counter-terrorism, foreign internal defense, humanitarian assistance and special reconnaissance. Pararescuemen are parachute-jump qualified personnel-recovery specialists. They maintain emergency medical technician credentials throughout their careers and provide life-saving trauma care in the world’s most remote areas, including combat environments. 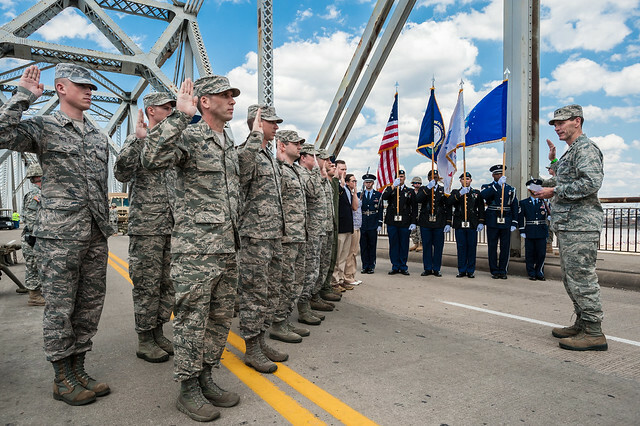 One of the highlights of Clarke’s visit was the opportunity to kick off the Thunder Over Louisville air show by swearing in 15 members of the Kentucky Air National Guard during live television coverage. 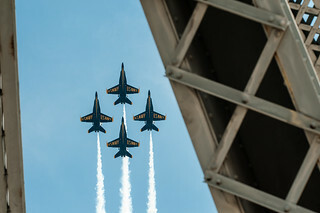 The annual show, which is staged over the Ohio River and featured performances this year by the U.S. Navy Blue Angels, U.S. Air Force F-22 Raptor Demonstration Team and 15 other acts, drew a crowd of more than 650,000 spectators. Television coverage, broadcast in Louisville from 12:30 to 10:30 p.m., will be edited down for global rebroadcast on Armed Forces Network over the 4th of July weekend. “It’s pretty exciting to begin my career in the Kentucky Air National Guard by having a three-star general swear me in on live television,” said Samantha Ruzanaka, a new recruit who will be joining the 123rd Security Forces Squadron here as a fire team member. “This a great unit, and that was a great way to begin serving my state and nation,” she said. The event also was a great experience for Clarke, whose son-in-law, Jacob Reynolds, was among the Airmen being sworn in. Reynolds is joining the Kentucky Air Guard’s 123rd Aircraft Maintenance Squadron as a C-130 crew chief. Clarke noted that his friend, retired Lt. Gen. John Conaway, a former Kentucky Air Guardsman who served as chief of the National Guard Bureau from 1990 to 1993, had been encouraging him to visit Louisville and the 123rd Airlift Wing for a long time. 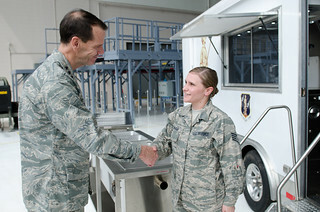 The 123rd Airlift Wing is one of the most decorated wings in the United States Air Force, with 15 Air Force Outstanding Unit Awards, six Distinguished Flying Unit Plaques, three Metcalf Trophies and three Spaatz Trophies. The Metcalf Trophy is awarded annually to the top airlift unit in the Air National Guard, and the Spaatz Trophy is bestowed on the country’s premier Air Guard flying unit each year.